You need a system that's fully secure, but still allows assets to be shared easily. You want the flexibility to grow, but you don't want to break the bank with upfront investment costs. And you require constant reliability and fast connectivity at all times. So which is better, a cloud-based DAM or a self-hosted system? One of the first areas you need to think about is your current IT infrastructure. A digital asset management system hosted by your organisation will need to have all the necessary equipment and expertise to ensure it functions correctly. Do you have an IT team that can efficiently and effectively set-up a DAM system within your current technology framework? Do you have the servers and storage you'll need to handle a new system seamlessly? If not, a cloud-based DAM system takes away all the worry and cost of setting-up on-site. You can be up and running in no time at all, with full support on hand if you need it. Hosting a DAM system yourself does give you the benefit of leveraging existing networks, servers and storage options, and integrating processes the way you'd like without having to worry about firewall issues. 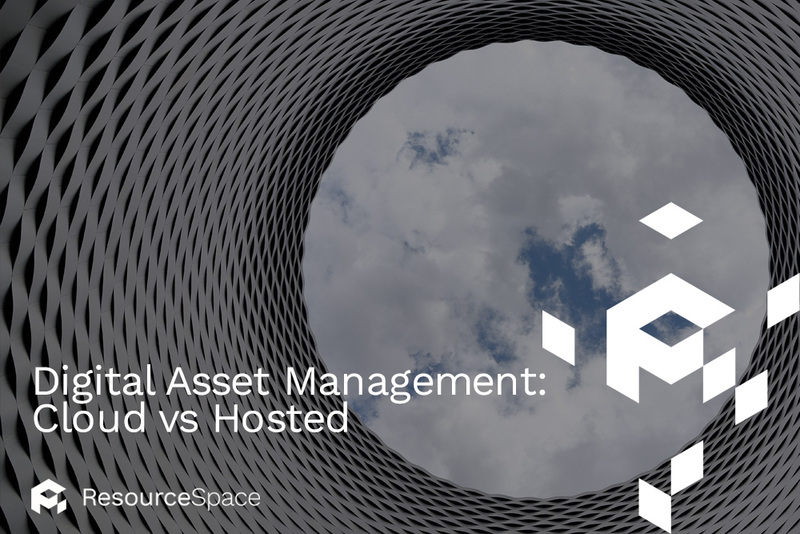 But equally, a good cloud-based Digital Asset Management system like ResourceSpace should also integrate seamlessly, exactly how you want. When it comes to storage, there are some potential downsides if you decide to host your own DAM system. You'll need to think carefully about the amount of storage space you need. Underestimate and you'll run out of available space for all your assets. Overestimate, and you'll be paying for storage you never need. Alternatively, you'll need to spend the upfront time and cost to set-up a system that can be easily scaled on-demand. But with DAM in the cloud, you'll have automatic scalability whenever required, and you'll only pay for the space you need - especially if you choose a system like ResourceSpace, with your own dedicated, powerful server and storage. One of the main benefits of a hosted DAM system is that you'll have instant, fast connectivity, as it doesn't need to rely on an internet connection - unlike cloud-based DAMs. That's great if you're on-premise and local to your organisation. But what about if employees need remote access from home or on-the-go, or you have offices around the world that require shared access to the same assets? With a cloud-based DAM, wherever you are in the world you don't need to worry about accessing the assets you need. As long as you have an internet connection, you'll be able to sign into your DAM system. Perhaps the biggest concern with a cloud-based DAM is security. Global accessibility could mean an increased risk of hacking or lost data. But that just depends on the type of DAM software you decide to use. At ResourceSpace for example, security is of paramount concern. We only use Europe's largest, secure data centre in London to secure your valuable assets. Both the data centre and ourselves have full ISO 27001 certification in this regard. Off-site storage in a dedicated data centre can also help ensure you comply with all the latest data protection regulations too. However, in some circumstances, regulatory compliance or sector-specific laws may require you to keep data on site, and so a self-hosted DAM is the best option. The added benefit of a cloud-based DAM is the automatic backups. With regular off-site and offline backups of your assets, you know all your data is safe in the event of any accidents or disasters. It makes recovery quick and simple. With a hosted DAM, you'll need to prepare for power failures, equipment faults and other potential problems. When choosing between a cloud-based or on-site hosted Digital Asset Management system, the most important thing to remember is your circumstances and your needs. Every business is different, and both cloud and hosted bring with them a range of benefits that could be important for your organisation - depending on how you operate. Our white paper which discusses cloud hosting your DAM or hosting on premise goes into more details on the subject, or alternatively, our expert team would be more than happy to advise you on the best options for your needs. Talk to us today or if you're ready to learn more about ResourceSpace, start your free DAM trial.